A sign in a Hong Kong market announces the catch of the day: silky shark fins. At an exorbitant price, they are the key ingredient in the popular shark-fin soup and a key item for fishermen to bring to shore. But is the silky shark fin in the market really from a silky shark? Does it matter? In order to establish a plan to protect vulnerable shark species from exploitation, conservationists need a starting point. How is each individual species doing? Is it exploited? What are the effects of fishing pressure? Answering these questions to determine the health of a particular shark population isn’t easy, however. Sharks are often widely distributed throughout the world and catch rates (how often a particular species is caught, intentionally or accidentally) are not always recorded or reported. In the case of animals caught for the fin trade, the bodies don’t even make it to shore, meaning a positive identification of the sharks being caught is difficult. DNA testing has always been possible but existing genetic tests have been criticized as too slow and expensive for practical use in monitoring the shark trade. That’s why an international team, including researchers from London’s Imperial College and Wildlife Conservation Society and Florida’s Nova Southeastern University, set about creating a simple genetic test to screen for many species at once. The team’s results, published in the August 2002 edition of the journal Conservation Biology, describe effective tests for six species commonly caught in the North Atlantic. The six sharks come from only two families (Lamnidae and Carcharhinidae). They’re not only closely related to each other, but also to more than 30 other species found in the same waters. Despite the relationship between the species, the group was able to develop nearly 100-per-cent accurate ID tests for the blue, dusky, longfin mako, shortfin mako, porbeagle and silky shark. Running 33 samples of closely-related, known species through the tests, delivered the appropriate response for every species but one: the test for the dusky shark also turned up positive for the oceanic whitetip. While not perfect, the researchers suggest the test is perfectly usable in the field, since possible misidentification from the known flaw can be avoided by looking over the fin in question. Oceanic whitetip sharks have large, paddle-like fins with rounded white tips, while the fins of dusky sharks are long and curved with dusky tips but no prominent markings. For efficiency’s sake, the tests for each species can be run together to analyze for six species all at once. When the group tested this procedure, it found the same degree of accuracy as before, with the false positive for dusky/whitetip as the only flaw. When the group put the proven test to work on actual samples from Hong Kong fish markets, the real usefulness of this type of analysis was clear. Even on samples from dried fins, the multi-species diagnostic tool was able to amplify the DNA, revealing that fins for sale don’t always carry the proper label. The group took samples from 75 market-bound fins. The traders had designated 12 of them as blue shark, 8 as mako (without identifying the specific species) and 55 as silky. After the test, the 12 blue samples were confirmed as true blue, seven of the mako samples were genetically identified as shortfin mako and 45 of the silky samples were genetically identified as silky shark. The remaining 11 samples (1 labeled mako and 10 labeled silky) didn’t test positive for any of the targeted species, leaving their genetic identities up in the air. All the researchers could say for sure is that those fins didn’t come from blue, dusky, longfin or shortfin mako, porbeagle or silky sharks. The next goal for the research group is to develop more genetic tests to diagnose each of the major species of exploited sharks. 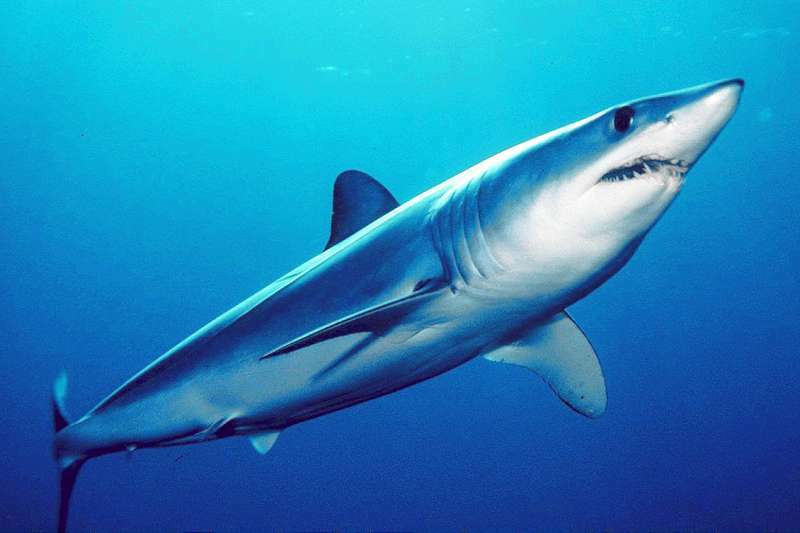 The study’s lead author Mahmood Shivji says these include sharks in the order Carcharhiniformes (such as sandbar, blacktip, bull, spinner, tiger, grey reef, blacktip reef, bignose, Galapagos shark, and the various hammerhead species) and the order Lamniformes (such as salmon shark, pelagic thresher, common thresher, bigeye thresher, basking shark, and sand tiger). Shivji explains these new tests could be used by anyone wanting to better understand shark fishery practices and monitor trade in shark products. “Examples include governmental agencies involved in fisheries/natural resource management, governmental and non-governmental conservation organizations, international organizations such as CITES [Convention on International Trade in Endangered Species] to monitor trade, and possibly even the UN Food and Agriculture Organization,” he says. Indeed the FAO recommended the collection of data on species-specific shark catch and landings in its International Plan of Action for the Conservation and Management of Sharks. This new tool is one step toward that goal.